The internet is far and away the greatest resource of knowledge available — so it should be no surprise that, rather than using this incredible resource for inane Googling, many people prefer to use it to learn something of substance and value. These days, you don’t have to go to school or college to learn — millions of people use eCourses to educate themselves at their own pace and from the comfort of their own home. These people are prepared to pay good money for knowledge, too. Webmasters are finally opening their eyes to the earning potential of eCourses. If you’re not convinced, just look at the success Udemy is enjoying — 40,000 courses and 10 million students (and counting). However, when you use platforms such as Udemy, you have to play by someone else’s rules. Most course providers prefer having full control over their course’s earnings, management, and promotion, which is a luxury only afforded to those who self-host their course on their own website. 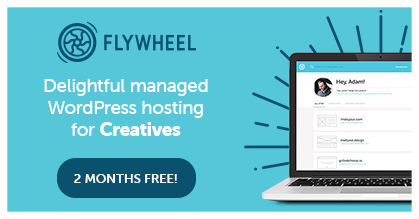 If you do want to self-host, though, WordPress is arguably the best website-building tool available to you — giving you free rein to share your knowledge with the world. All you need is a Learning Management System (LMS) plugin. A good LMS comes equipped with all the features and functionalities you need to run online courses — from building the course from the ground up, right the way through to providing your students with certificates of completion. And there are lots of great LMS plugin options out there — let’s take an in-depth look at the top five. First up, we have one of the most powerful and comprehensive learning management systems out there: WP Courseware. This plugin lets you split your courses into units — content pages that act like individual lessons — and modules. This gives your courses a familiar structure for students to work through at their own pace. Units are created in the same way as typical WordPress posts — within each one, you can write text, share links, and embed media (such as video or audio). When you’ve crafted all of your units, you can use WP Courseware’s intuitive drag-and-drop functionality to organize them into a logical order. Drag and drop lets you assign units to a module, and then re-order units/modules for optimal flow. Of course, the ultimate aim of any eCourse is to help students to learn. 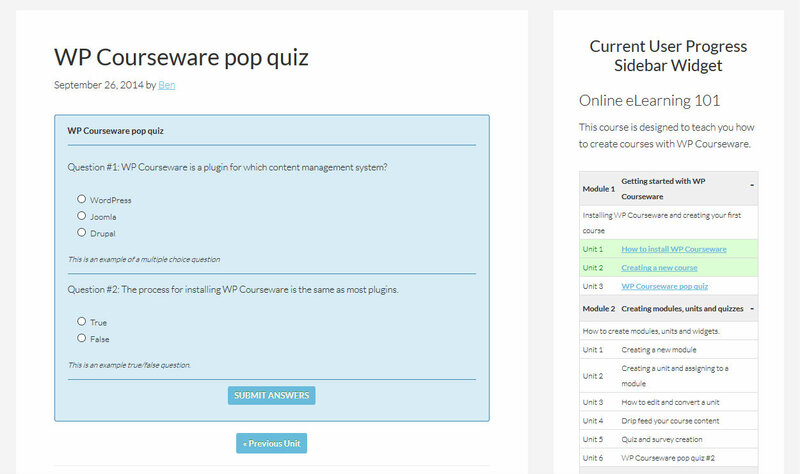 To ensure your students are progressing, WP Courseware comes with a range of quiz functionalities. There’s an impressive range of question types — including multi-choice, open-ended questions, and file upload — letting you create assessments that truly test your students’ understanding of a particular module. Enhancing the quizzing functionality further, you can also specify what marks constitute what grades, as well as time limits, and the number of retakes permitted. And, to combat question familiarity (where students simply memorize the correct answers) WP Courseware also supports randomized questions. Results can be downloaded in PDF format at the end of the quiz, or teachers can send results directly to a student’s inbox. WP Courseware also boasts a number of widgets designed to help students track their progress. My favorite is the course outline widget, which students can use to jump to specific modules and units. There’s also a dynamic progress widget, so students know how much material remains in the current module. To keep students progressing at a similar pace, WP Courseware ships with drip-feed functionality, letting you restrict certain modules until a later stage. You can configure access to new modules to open at fixed dates, specified intervals after enrollment, or after the completion of prior modules. To reward your students for completing the course, you can award personalized certificates. They can be fully customized, and are a really nice touch. WP Courseware was also developed to help you make money by selling your courses. 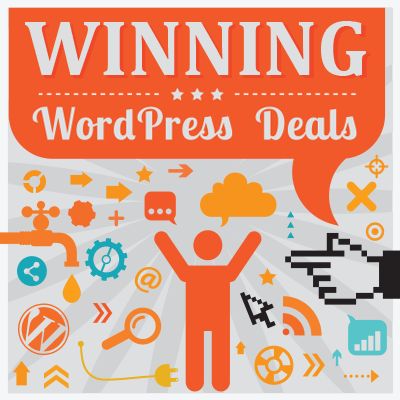 As such, the plugin supports full integration with some of the most popular eCommerce plugins: WooCommerce, Easy Digital Downloads, and iThemes Exchange (if you’re unsure which of these is best, check out WinningWP’s comparison of the three). These integrations are made possible via free extensions from the official repository. There are a further ten integration extensions available, offering compatibility with the likes of OptimizePress and MemberPress. WP Courseware licenses start from $99, which includes one years’ support and updates. The plugin is fully compatible with any WordPress theme, too. Next up, we have the WooThemes-developed Sensei plugin — a single site license costs $149. The plugin is compatible with the vast majority of WordPress themes, but WooThemes has also developed a range of Sensei-compatible themes. Sensei splits courses differently from WP Courseware, simply breaking them into lessons. These lessons are configured exactly like standard WordPress posts/pages, with specific lesson settings configured via a meta box directly below the WordPress visual editor. From this meta box, you can specify the lesson length, give it a complexity rating, and embed a video. You can configure a quiz that students have to pass to mark the lesson as complete, and you can control every aspect of this — from number of questions to pass marks. You can also create a question bank for each lesson, and Sensei will then display random questions from this bank for students to answer. Multi-choice quizzes are graded automatically, with students receiving their grades immediately — you can preconfigure marks required for each grade. For open-ended questions that require a teacher’s review, students can pick up their marks from a student dashboard area, which also displays the student’s overall progress throughout the course. One of the plugin’s coolest features is prerequisites, which allows you to sync your course with a WooCommerce product. In other words, you can charge for your courses, with payment handled by the WooCommerce checkout. Thinking outside the box, this feature can also be used to offer courses with physical products — for example, when a customer purchases a guitar, they also get access to a Learn to Play Guitar eCourse. Sensei also boasts a helpful analytics tool that offers greater insight into students’ progress. This lets teachers track key metrics such as total enrollments, lesson completion rate, and average mark per lesson. Sensei Content Drip ($39) — choose when students can access course material by drip-feeding content. Sensei Certificates (FREE) — present your students with a certificate upon course completion. Sensei Media Attachments (FREE) — attach other media files to lessons, such as PDFs. Sensei Course Progress (FREE) — let students track their progress via a sidebar widget. Sensei Course Participants (FREE) — display avatars of other students enrolled on the course, plus total enrollment figures. Sensei Share Your Grade (FREE) — students can share their lesson grades via social media. Sensei BadgeOS ($19) — a fun reward system that lets students earn digital badges for their course progress. When published, lessons are displayed in eye-catching lightboxes, which feels like a really comfortable way to learn. 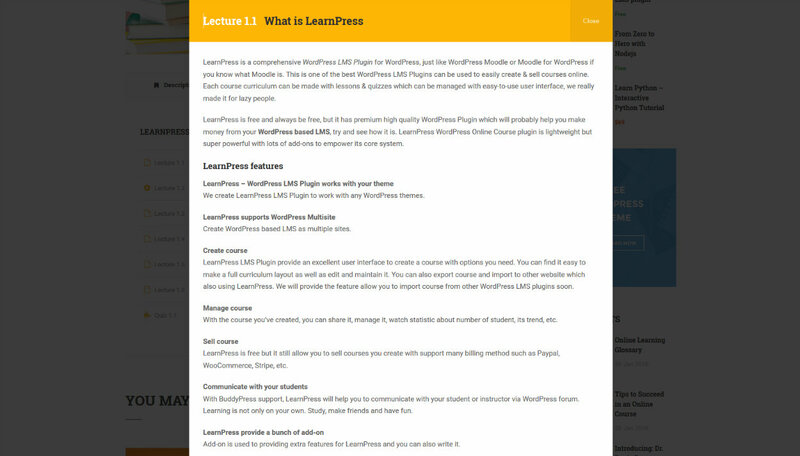 LearnPress is compatible with any WordPress theme, however the developer has launched two dedicated LearnPress themes on ThemeForest: Education WP and eLearning WP, costing $59 each. Both look stunning, so I strongly recommend checking them out. 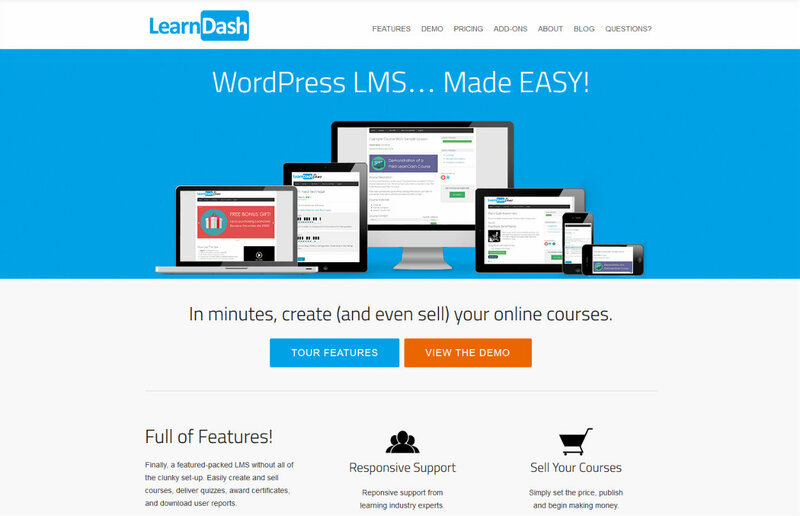 LearnDash is another exceptional, all-in-one learning management system for WordPress; it comes with an impressive range of features, making it as easy as possible for you to create online courses. For a start, LearnDash supports multi-tier courses, so you can structure them by splitting them into lessons, topics, quizzes, and categories. The course content can be drip-fed to students, keeping them all working to the same schedule, and you can also restrict access to certain lessons by configuring prerequisites (this requires students to have completed previous courses/lessons/quizzes before they can move on). Quizzes are a valuable tool for tracking students’ progress, and LearnDash comes with built-in support for seven question types, including multi-choice, single-word, essay, and drag-and-drop. Questions can also be asked in text, audio, and video format, and, for a more thorough assessment, you can set assignments that students submit by uploading a document to your website. LearnDash quizzes come with lots of cool social features, too. For a start, visitors can earn certificates and level up based on their performance. And, as an incentive, top-scorers are displayed on public leaderboards. From the back end, teachers get a thorough break-down of quiz performances. They can review individuals’ answers, or check the overall group’s progress by looking at statistics by question. 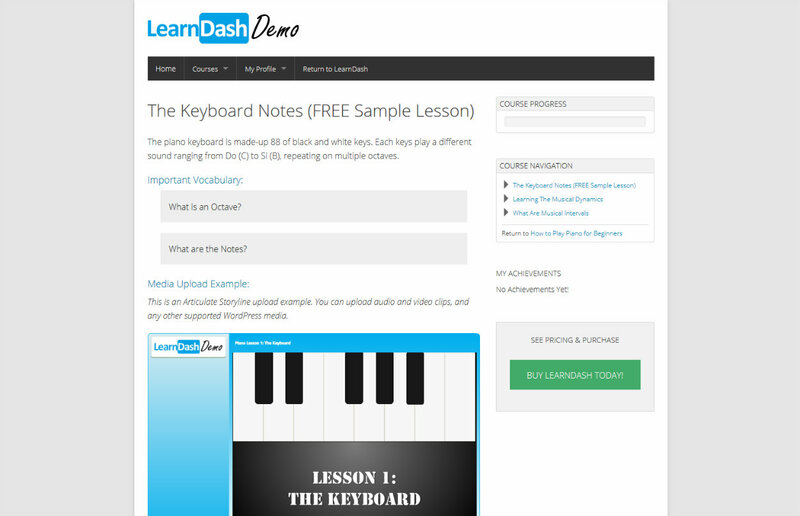 LearnDash also lets you create dedicated forums for your courses. Students can use this area to support each other and socialize — with each student required to create a front-end user profile. Don’t underestimate how important the social element is to students! Payment Gateways (FREE) — to facilitate the selling of courses, LearnDash offer free payment gateway extensions for WooCommerce, Stripe, Easy Digital Downloads, and 2Checkout. Event Espresso Integration (FREE) — makes it possible to offer eCourses with your live events. Course Grid (FREE) — displays available courses in stylish product grids. Visual Customizer ($29) — lets you brand your course with fully customizable course content, widgets, and progress bars. Front-end Course Creation ($35) — lets you create your courses on your site’s front end. This is more user-friendly than the WordPress back end, and also lets visitors register as a course author, turning your website into a full-on eCourse marketplace. LifterLMS is another learning management system with a free core. It’s highly regarded in the WordPress community, making it a great option for powering your courses. In fact, WP101 recently migrated its courses to LifterLMS — that’s quite the endorsement! The plugin works like a membership website — students register or purchase a course, this upgrades their membership level, then they can access the relevant content. All course materials are assembled via the WordPress back end — the interface is straightforward to use, letting you build your course from a series of modules and lessons. Lessons can be text, video, or audio-based, so you can target different learning styles, while video courses are usually considered more premium, which can justify a higher price tag. 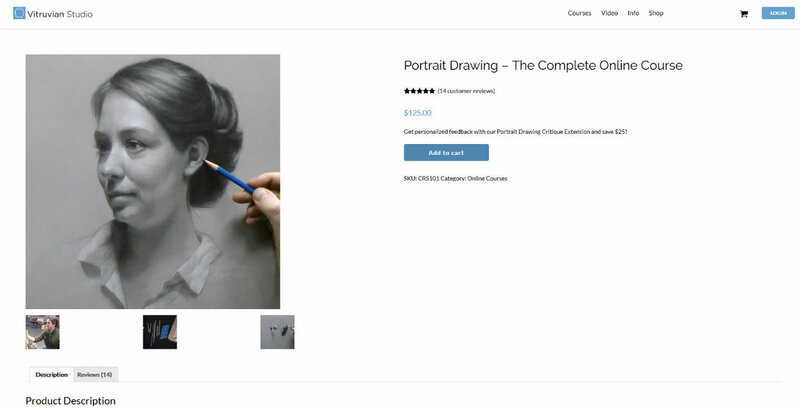 Speaking of price tags, LifterLMS comes with built-in shopping cart functionality, which you can use to sell your courses. Three payment gateways are supported to date: PayPal (free with the core), WooCommerce (free via extension), and Stripe ($99 extension). To entice students in and boost sales, LifterLMS lets you configure coupons, too. Other useful features include content drip, quizzes, analytics, and gamification — gamification awards badges based on student performance. For a free plugin, you may be surprised to learn that LifterLMS boasts several unique features. 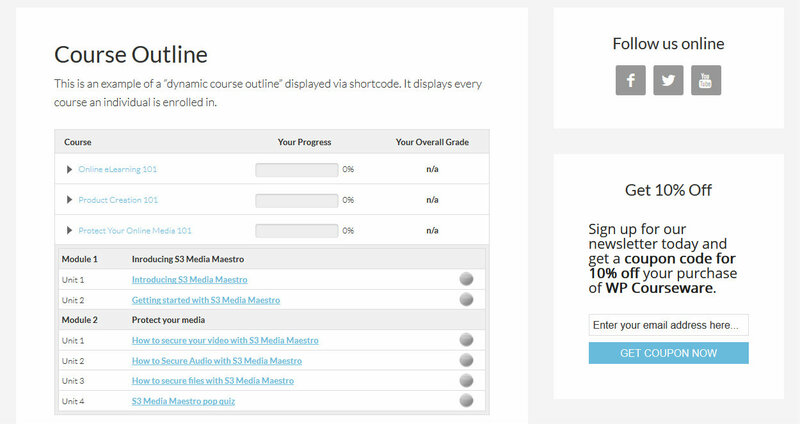 For starters, there are custom sidebars, letting you add dedicated sidebar widgets to enhance your courses. Most impressively, though, LifterLMS supports an automated email system that’s designed to boost student engagement. Students trigger automated emails a number of ways — such as not logging in for a predetermined amount of time, failing a module, or leaving a required quiz incomplete. If you want to upgrade, LifterLMS Pro is available for $99 a year. The pro version is primarily a priority support service, with the developer promising more timely responses and a greater level of detail. However, to sweeten the deal, LifterLMS Pro also supports a few extra graphics for your gamification system. And that completes our in-depth run-down of five of the best learning management systems for WordPress! Because all five plugins are exceptionally well-equipped for the job, you’ll find a good amount of overlap in features and functionalities. For example, all plugins featured today make it really easy for you to create courses from the WordPress back end, quiz students, and, ultimately, sell your courses. However, the plugins do differ in terms of prices and some additional luxury features — sometimes offered as extensions. Which LMS plugin is best? Well, that depends on the features you need. My tip is to consider any specialist functionality your LMS requires, then work backwards, checking to see if your favorite plugin supports it. Just remember: Whichever plugin you choose from this list, you won’t go far wrong. They’re all easy to use, and each supports all the core LMS functionality you’ll need. And, if you’re really stuck? Choose one of the free options, see how you get on, and then consider upgrading with premium extensions! 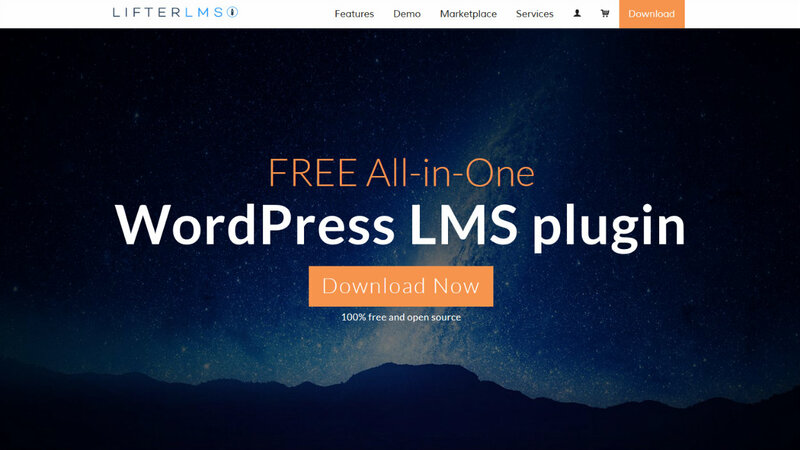 Using any of the above LMS plugins? Thoughts? That’s not one I’ve heard of before, which is surprising… Is it relatively new? Are you using it or involved in its development? I’m not involved, just been following it’s development (it is pretty new) and had a potential project for it. This is a great post and will certainly be useful for those in the market for a WordPress LMS. Also, thank you for including LearnDash on your list and for your thoughtful summary of our offering. You’re absolutely right about other hosted platforms and “playing by their rules” (as you put it). It’s important to remember that in order to build a lasting online business selling courses you should pick a platform that is not only flexible, but allows you to call the shots. I think this is why people choose to host their programs on WordPress. It can scale and modify according to the needs at the time. It’s also very accessible making it easy to get started. For me personally it never gets old seeing customers go from an idea to fully-functioning courses, many of which generating income. Again, congrats on the well-written article. It’s clear you spent a lot of time with your research and I know it will be appreciated. Thanks for reading the post and for taking the time to leave a comment. It might take a little more time to generate traffic going the self-hosted route, but the rewards at the end are well worth it. What a great write up Shaun. Thank you for including us at LifterLMS. People are often asking me and my team how we compare to the other WordPress LMS solutions out there. It’s great to have well written unbiased articles like this to also point them to for their research. Thanks for your kind words. I can see why people struggle with researching the plugins in this niche in particular, with so many great options available! Yes these are exiting times in the WordPress LMS community. There are a lot of great plugins and development teams out there who approach the challenges of LMS and online education in different ways. Thank you SO much Shaun. I don’t do my WP personally, (I have a VA who does) but I need to be able to go in and make changes as the course creator/facilitator. And I love the automatic email notifications to increase engagement feature, so this will help me decide. You’re a STAR for writing this up! 1.there are many course categories in which courses are there and in courses there are many lessons. 2.in each course category there must be particular meenu beside main home meenu , that meenu comes in all pages related to that course category. 3.any teacher who want to teach particular course , can access through login and can upload videos & other material on its own , after getting permission from admin that lesson must appear. and that teacher can earn via his paid material. 4.quiz must be uploaded through excel or pdf material. 5. any body can purchase in bulk but for particular time. 6.every student can make their own class in which selected courses can appear. please suggest me best theme or lms plugin. Do Learnpress or LifterLMS integrate with Active Campaign at all, and how? And my second question: how can I protect the couse content? We use WPLMS and its a great Theme, i think the best. Do you still use LearnDash and like it?